...the Aboriginal and Torres Strait Islander disability rights movement has achieved much over the past few years. The International Day of Persons with Disabilities (IDPWD), December 3, is important for commemorating the successes and efforts of the disability rights movement. The theme this year is Sustainable Development. Along with other Indigenous peoples worldwide, Aboriginal and Torres Strait Islander peoples have much to celebrate. At the same time, the Australian disability services sector is undergoing its most significant reform since the Disability Services Act 1986. The inception of the National Disability Insurance Scheme has been justifiably described as the biggest public policy reform since the introduction of Medicare in the 1980s. While many challenges remain, we do have reasons to celebrate. In public policy, knowing the size and scale of the challenge is often the first step to finding sustainable solutions. Australia has improved on the reporting of disability within Aboriginal and Torres Strait Islander communities over the last few years. After significant lobbying, Australia is now one of the few countries to collect information on disability in the census. This is an important resource for Australians. The Census is often the only source of data available at the scale we need. Census data can also be used at the national level for Aboriginal and Torres Strait Islander peoples and organisations to advocate for change. So what does the data say? 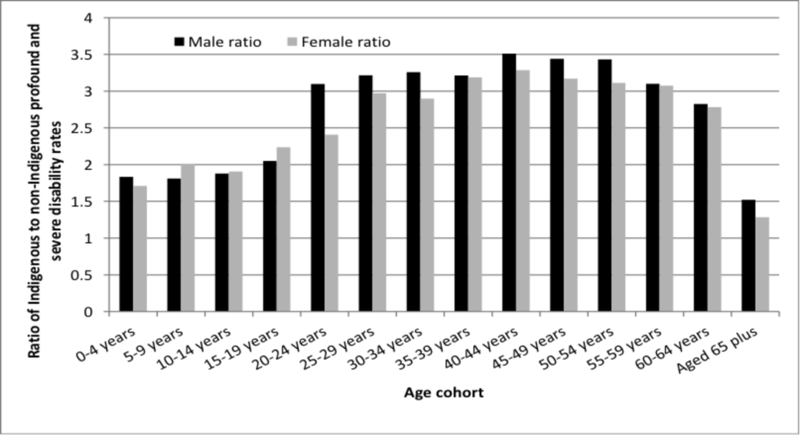 Well, the following figure from work undertaken by one of us shows a clear association between age and the likelihood of reporting a profound or severe disability. For both the Aboriginal and Torres Strait Islander population and non-Aboriginal and Torres Strait Islander population, the rate is low and relatively stable for age groups from 0–34 years. For the Aboriginal and Torres Strait Islander population, the proportion with a profound or severe disability starts to increase from 35–39 years. By 65 and above, more than a quarter of the Aboriginal and Torres Strait Islander population have such a disability. 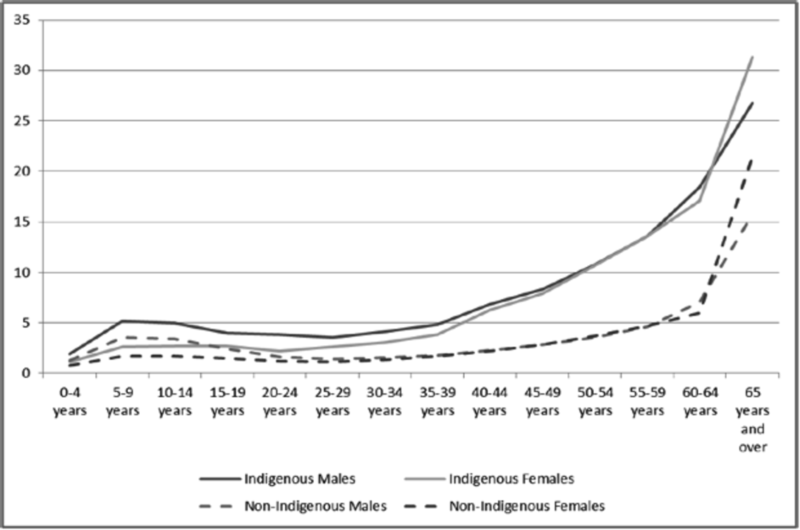 For the non-Aboriginal and Torres Strait Islander population, the rate of profound or severe disability starts to increase from the mid-30s, but the substantial increase does not occur until the ages of 60–64. Census data can also be used to dispel myths about Aboriginal and Torres Strait Islander peoples. We can see in the figure below, for example, that the high rate of disability is not solely because they are more likely to live in remote parts of the country. Here, we look at the ratio of Aboriginal and Torres Strait Islander population to non-Aboriginal and Torres Strait Islander population rates of profound/severe disability in large urban centres (those with a population of 100,000 or more). Even in Australia’s largest urban centres, Aboriginal and Torres Strait Islander peoples are more likely to report a disability than their non-Indigenous counterparts. This is so for every age group. However, the disparity is greatest between the ages of 20 and 64. This data can be used to target our policy response. Another important finding from the data is the role that Aboriginal and Torres Strait Islander carers continue to play. No doubt this can sometimes take a heavy toll, but this caring work needs to be celebrated. Statistics are important, but they are not enough. On this IDPWD, we can go beyond statistical understanding of rates of disability and qualify this data by exploring Aboriginal and Torres Strait Islander people’s lived reality and experiences of disability. Aboriginal and Torres Strait Islander peoples have stronger representation when compared to our representations to government during the disability service reforms of the 1980s. Crucially, we have the First Peoples Disability Network (FPDN) advocating on behalf of people with a disability on state and national government committees and working groups. The Aboriginal Disability Network NSW held its state conference, Living My Way, this year. This was an opportunity for Aboriginal and Torres Strait Islander people with a disability, non-government and government stakeholder representatives to openly discuss policy issues. Belinda Mason and the FPDN launched the photography exhibition, Unfinished Business, at the United Nations in Geneva in 2013. The exhibition was Australia’s official contribution to the United Nations 2014 World Conference on Indigenous Persons in New York. We also have a better understanding of the research gaps. The Centre for Disability Research and Policy (CDRP) produced the National Audit of Disability Research, which identified many gaps in Australian research. So did a recent Research Monograph produced by researchers at the Australian National University and the Australian Institute of Health and Welfare. What these reviews show is that although Aboriginal and Torres Strait Islanders are one of the most researched cultural groups, scant research has been undertaken with people with a disability. These reports demonstrate that we need an affirmative action approach to improve the quality of our evidence base for Aboriginal and Torres Strait Islander people with a disability. In response, the FPDN and the disability research community formalised the National Aboriginal and Torres Strait Islander Disability Research Network. This consists of Aboriginal and Torres Strait Islander peoples, researchers, government representatives and advocates. The network aims to develop and implement a research agenda that empowers Aboriginal and Torres Strait Islander children, young people and adults with a disability, their families and communities. The network is finalising a research agenda to set out steps that will be undertaken to identify and address research gaps. This is a significant outcome for the FPDN. It is easy to be overwhelmed by negative data and stories. Yet the Aboriginal and Torres Strait Islander disability rights movement has achieved much over the past few years. Today is a time for us as a nation to celebrate our achievements as we tackle the challenges ahead. It is not the events of today that determine our future; it is how we respond to those events. We must acknowledge that although we have a long way to go until we close the inequality gaps, we have taken many steps forward together.